Sun Ra is my musician of the year 2014 (together with Ken Vandermark). No kidding. Of course he left this planet 21 years ago but then again his 100th birthday was a great possibility to (re)discover seminal albums like Space is the Place, Art Forms from Dimensions Tomorrow, The Magic City, The Heliocentric Worlds of Sun Ra, Lanquidity, Cosmic Tones for Mental Therapy or Atlantis (to name just a few). I have also read (respectively I am reading) a lot about his life, his music and philosophy, for example John F. Szwed’s biography, essays by David Toop, John Litweiler and Valerie Wilmer and I also watched the marvelous documentary A Joyful Noise. Listening more closely to his music I recognized how influential he was and already is (for example for Mats Gustafsson’s larger ensembles). Both of the Roaratorio releases rather focus on what Stockhausen calls “first class experimental music”. In the liner notes to Strange Strings Tam Fiofori says that the music of Sun Ra on that record linked East and West, the instruments were “stretched, stroked, struck, picked and plucked to vibrate the air and radiate the rays of sounds in movements representing nature in music”, which is an excellent description of Ra’s music of that era. 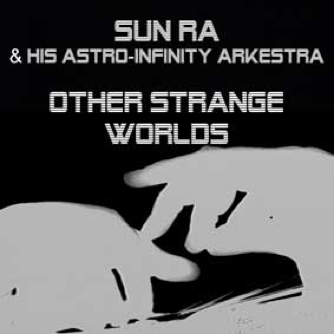 On Other Strange Worlds the Astro-Infinity Arkestra is reduced to a quintet of Sun Ra (percussion, strings, celeste, kalimba), John Gilmore (percussion, shakerae, cymbals), Marshall Allen (percussion, oboe, kora), Ali Hasaan (percussion, trombone) and Art Jenkins (percussion, space voice), the album is like a string study to Strange Strings. The titles of the pieces deal with space and the universe, the focus of the A side of the LP is on the strings and on celeste and kalimba while the B side rather features percussion – both elements referring to Ra’s music being centered in Africa (and ancient Egypt in particular). The reeds are sparsely used, the trombone only in “Voice within the Stars”, in a short dialogue with percussion, the oboe emerges twice in “The Other Beings” and in “Journey Amongst the Stars”. All in all a very nice finger exercise of one of the greatest bands in jazz history. 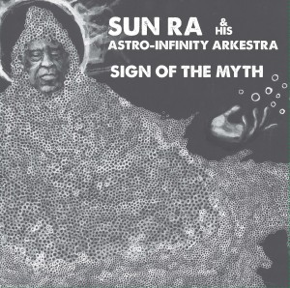 Although Sign of the Myth also features the Astro-Infinity Arkestra, this is a completely different album – a studio recording from 1973, when Ra released two new albums (Astro Black, Pathways To Unknown Worlds) or re-released Saturn back catalogue stuff for the Impulse label. Sign of the Myth originates from the Pathways To Unknown Worlds sessions and like In the Orbit of Ra, maybe the best of all 2014 releases, it also captures the brilliant and underestimated bass work of Ronnie Boykins – while Ra concentrates on spooky, spacey and psychedelic synthesizer sounds, which are like an electric carpet contrasting the wave of percussion and the free jazz reeds lines of the reed section consisting here of Eloe Omoe, Danny Ray Thompson, Kwame Hadi, Akh Tal Ebah, Marshall Allen, Danny Davis, and John Gilmore. With a constantly shifting array of Moog horror movie sounds, Ra structures the pieces, for example the title track, which can keep up with the best Arkestra tracks. Ra, Boykins and the percussion section start off before the saxes fall in trying to take control of the improvisation but in the end it is Boykins’s walking bass and Ra’s synth lines which prevail and even give an outlook to where the Arkestra was heading with Disco 3000 only five years later. Both albums are available on vinyl with download codes or on i-tunes (if you don’t have a record player). Sign of the Myth can be bought from the label www.roaratorio.com, where you can also listen to some of the music. I'm afraid I've struggled a bit with Sun Ra's music. There are some albums, like "the Heliocentric Worlds of Sun Ra" which are marvelous, and others that just sound like mildly eccentric reworkings of Ellington. I get both kinds of music, but I don't get why they're put together in this way, and I'm not convinced that it benefits either kind of music. It just seems a bit perverse, or maybe that's the point. Perhaps the penny will drop one day. Sometimes that happens. I think Sun Ra's output is so vast that there's something for almost everyone to love (or at least like) and to hate. For every track that seems merely eccentric, there's another one that is extremely compelling. It's the kind of thing where, apart from a very few canonical albums, it's hard to make recommendations. Since so many of the albums are available pretty cheap used, it's probably wisest to just wade in pretty deep and see what you find. Martin’s reference to the re-release of El Saturn recordings on the Impulse! label reminds me of the following, which nay (or may not) be of interest. Needless to say, the proposed contract didn’t go ahead – it was just too far out to happen (there were many similar amendments) – and therefore Implulse! Simply entered into a distribution deal for old El Saturn recordings. It does make you wonder however, just how seriously Sun Ra took all that space stuff. You are definitely not alone in your struggle with Sun Ra's music, Colin. Julia, my host at the SWR radio radio show, told me that Nate Wooley has the same problem. He said that he simply doesn't get what all the fuss about Sun Ra is about and the only things that puzzled him was the fact that so many musicians he admired named him as a huge influence. Although he said that he had tried a lot he couldn't find out what's the interesting thing in his music. Finally, he thinks that he might find out on his deathbed and that his last words might be: Finally, I get what all of you love about Sun Ra. And indeed I agree with Jeremy: Luckily there are a lot of great re-issues which are available at absolutely reasonable prices so that you can find out yourself. "You have to balance history with science fiction," she said. "It's the only way to keep sane"
Probably Sun Ra would have endorsed. Probably correct, if you're already slightly unhinged. And who hasn't been at least slightly unhinged in the last couple of hundred years on planet Earth? Well, I and many others have managed okay without believing that fiction is fact. I can't speak for everyone of course. I see, by the way "balancing reality with fiction" doesn't imply confusing them... or does it? If yes, world would be a much more incomprehensible place than what already is. If not, world would be instead a much more explicable place. And this doesn't seem the case as well. Sun Ra certainly seemed to confuse the two, but if it helped him get by that's fine by me. Some don't get all the fuss about Nate Wooley either, but if others do, so be it. I'll assume it's me and move on. I love some Sun Ra and hate some. This kind of reminds me of sports fans lamenting that their favorite athlete is tarnishing their reputation by playing past their prime. So what. I think the man was doing his thing and I respect that. If you want to find the good in Sun Ra you have to put up with some cheesy lounge music on the way.